MT30 has been design and build on the basis of ATEX 94/9/CE directive with type of protection EEx-d [ia] IIB T6 and completely water tight (IP 66). MT30 allows safe loading and unloading of mobile tanks (mounted on trucks, wagons or trolleys and also big bags) in which flammable substances are poured at high speed generating electrostatic charges that can cause sparks and explosions. To prevent the accumulation of static electricity, the device verifies that the correct connection to ground is performed before starting of the loading procedure, in this way dangerous situations due to failures and human errors can be avoided. 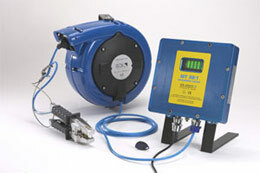 The device is connected through a bipolar cable, perhaps wound in a cable reel, and clamp to a mobile tank.